The Majnu Ka Tilla Gurdwara stands atop a small mound on the banks of the Yamuna river. The area was named after a Sufi nicknamed Majnu who met Guru Nanak here in July 1505, discovers Reena Singh. On my numerous northbound trips out of Delhi towards Punjab, I would bow my head reverentially while cruising past the Majnu Ka Tilla Gurdwara that stands white and majestic atop a small mound on the banks of the Yamuna, vowing to visit it on my way back. I finally did, but only recently. An unusual story surrounds this gurdwara. For one, it is steeped in history, the spot having been first consecrated in 1505 at the time of Badshah Sikander Lodi. For another, it stands on the banks of the Yamuna, on a height, commanding a view of the river. We could not but help imagine how pretty the view must have been of the Yamuna river, flowing majestically besides this mound back in 1505. You can feel the serenity even now - if you close your nose to the stench of the modern-day river that wafts frequently into your nose! We photographed the view anyway, and got a pretty good shot of the Yamuna flowing alongside. We couldn't help think that had the Yamuna been prettier or more environmentally managed, the view would have been spectacular, and the gurdwara definitely better known, but that is the subject of another discussion. Guru Nanak, while visiting Delhi, met the resident Iranian Sufi bhakt, Abdulla, who lived atop this little mound, on the river's bank. The hermit was reed-thin, spending all his waking moments fasting and looking for the true meaning of God - in vain. He would ferry people across the river in his boat - for free - as service to God. People called him Majnu, so lost was he in love and devotion for God. Abdulla's quest for enlightenment and for the true meaning of God, made him vow to meet Baba Nanak when he heard that the great Guru was in the vicinity. He finally did meet him on July 20, 1505. This fact is intrinsically woven with another tale at this sacred spot. While the Guru was sitting with his new bhakt, there was the sound of a mahout crying aloud at the loss of the Badshah's elephant under his care. Moved by the sound of his piteous crying, the Guru brought the animal back to life, much to everyone's amazement. The Guru stayed at the spot till the end of July. So pleased was he with the mad, selfless devotion to God by the Sufi hermit - who people said behaved much like the proverbial love-forsaken Majnu - that Nanak told him this area would be immortalised by his name - as Majnu Ka Tilla or the hillock of Majnu - till the world ended. Later, the small gurdwara that was built there by General Baghel Singh in 1783 was known by this name. And that's how the name and the gurdwara came about - a Sikh shrine named after a devout Iranian Sufi believer. It stands tall now as an amalgamation of faith, and of the ultimate belief in Ek Onkar, that whatever faith you might believe in, the Ultimate God is One. 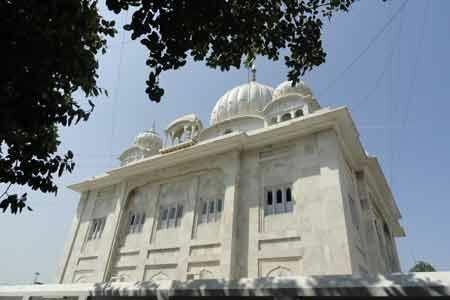 The gurdwara has vast grounds and a sarai, where tired travellers driving up or down the Grand Trunk Road (now National Highway No 1) can stay. It has a kitchen that serves free langar to anyone who stops by. We also trooped into the langar mess, and partook of a humble meal of puri, channa-aloo and apple that they served for breakfast that day. The jagir, or estate, that surrounds it was a gift from Maharaja Ranjit Singh, and the birthday of the Khalsa is celebrated here with much festivity on Baisaki day. A huge sangat gathers here for the day's kirtan, path, and ardas and for participating in the community kitchen that marks Baisakhi. Puran Mashi is also celebrated here enthusiastically. Says Granthi Bhai Jaswinder Singh, who lives in the complex, "You can also burn your old, tattered religious texts and holy books at the chimney that forms part of the gurdwara complex." He adds that people of all religions bring their disused and tattered holy books to be given a final farewell here. Long after Guru Nanak met Majnu, the sixth Sikh guru, Guru Har Gobind also stayed here, when he visited Delhi on an invitation from Emperor Jahangir. 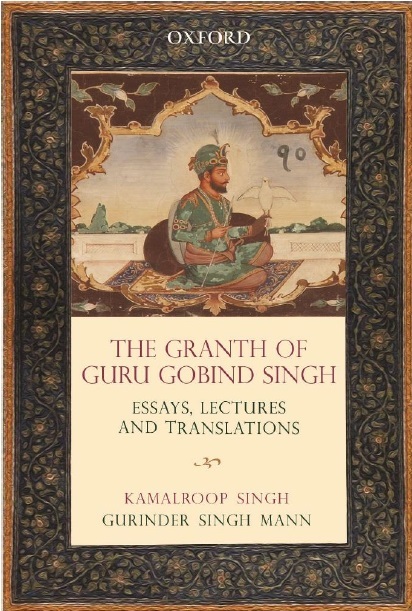 But the emperor was suspicious of the Guru and had him deported to Gwalior and imprisoned there. Later Guru Har Gobind was released, and on his way back to Punjab, Guruji again stayed at Majnu Ka Tilla. The marble gurdwara that now stands at this spot was built here in the early '80s, although the small one that has existed over centuries still stands within the complex. The first gurdwara was built by Baghel Singh, when he and 40,000 troops entered the Red Fort in March 1783, and occupied the Diwan-e-am. The Mughal emperor Shah Alam II made a settlement with Baghel Singh, allowing him to raise gurdwaras on Sikh historical sites in the city as well as receive six annas in a rupee (37.5 per cent) of all the octroi duties in the capital. The general camped in the nearby Subzi Mandi with his troops and identified seven sites connected to the Sikh Gurus and had shrines raised on them within eight months. The credit of building the capital's famous Sikh shrines, thus goes to Baghel Singh. For the outbound road traveller on the GT Road, this is a regular stop. Gurdwara Sis Ganj Sahib was built by Baghel Singh to commemorate the martyrdom site of the ninth Sikh Guru, Guru Tegh Bahadur, is worth a visit. The gurdwara is known to serve langar 24 hours.